New book breaks myths of the role of the female leader’s husband. As more women become leaders, both men and women can take pride in the shift. As more women begin to lead others in high-ranking positions, it’s the public’s perception that can be slow to follow. When pastor Jacqueline Taylor encountered misunderstanding about the roles of her and her husband, the church’s first gentleman, she discovered a lack of studies defining their respective responsibilities. Wanting to fill the void, she began conducting research. 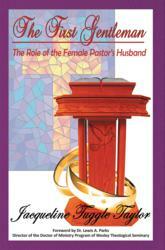 In her new book The First Gentleman, Taylor addresses the shift of women in ministry and defines the role of their husbands. Encouraging both sexes to embrace an egalitarian culture in their churches, she urges pastors’ husbands to take pride in their own leadership positions. Rooted in research, the book provides case studies of biblical husbands of female leaders and analysis of comparative participant studies. Research findings encourage healthy partnership and innovative women. “As more women become leaders, both men and women can take pride in the shift,” says Taylor. Jacqueline Taylor is the pastor of the House of God Church in Essex, Md. Her ministry work includes setting up churches and organizing Bible study groups. She received her doctorate degree in practical theology from Wesley Theological Seminary, master’s degree in divinity from Eastern Theological Seminary of Lynchburg and master’s degree in leadership in teaching from Notre Dame of Maryland University. She has been married to her husband, Deacon Jarris Taylor Sr., for forty-seven years and is the proud mother of four and grandmother of ten.